Microsoft today announced a new version of Windows 10 that’s specifically geared toward professional users that use high-end hardware to support mission-critical workloads. 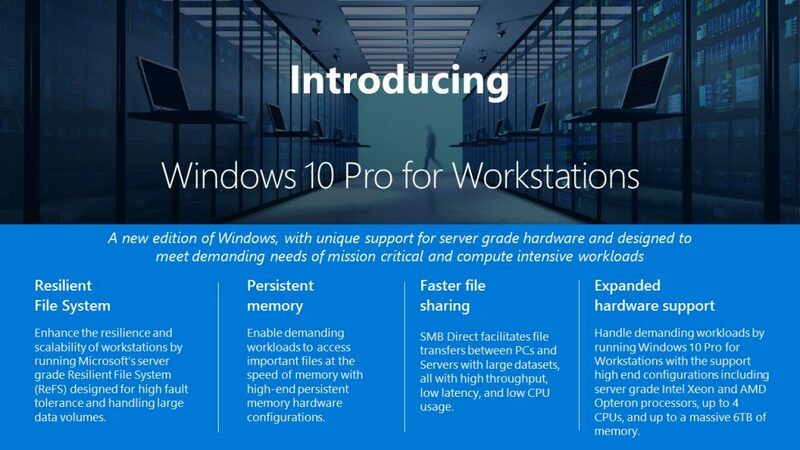 As rumored, Windows 10 Pro for Workstations will feature Microsoft’s server-grade file system (the Resilient File System), support for persistent memory (NVDIMM-N), faster file sharing with SMB Direct and support for high-end hardware with up to 4 CPUs and 6TB of memory. As the name implies, the focus here is indeed on high-end hardware and for this edition of Windows, which also means support for Intel Xeon and AMD Opteron processors. Standard versions of Windows 10 only support up to 2 CPUs and 2TB of memory, so this new version gives users on these top-of-the-line workstations (and the OEMs who want to build the hardware for them) access to a lot more power — especially when combined with persistent memory. The Resilient File System (ReFS), as the name implies, is meant to provide an extra level of data availability, resilience and fault-tolerance. It can handle very large volumes and automatically repair errors when data on one of the backup drives becomes corrupted. In comparison to Microsoft’s standard NTFS scheme, which can handle volumes of up to 256TB, ReSF can theoretically be used for volumes of up to 4.7 zettabytes (that’s about a billion terabytes and 8 million years of 8K video — so not something anybody would really need anytime soon). Users can then also take their data and use SMB Direct to make it available to other users on their network. Using the Remote Direct Memory Access capability of this new version of Windows 10, SMB Direct enables fast file access with low latency that barely uses the local CPU. This feature has been available in Microsoft’s server operating systems since the launch of Windows Server 2012, though it’s worth noting that it takes the right kind of network adapter to work. Windows 10 Pro for Workstations will launch later this fall as part of the Fall Creators Update.